If you follow me on Instagram, you know that I ordered an AncestryDNA test a couple of weeks ago. I have been researching my genealogy with Ancestry.com for about 4 years now, and I wanted to go a step forward. The process was very simple. You order the kit (It came in about a week for me.). You activate the test using the code from your kit on Ancestry.com. It is best before you order the kit to have a tree on Ancestry first so you can connect your results to it. Then you give your DNA sample (aka spit in a tube) and send it back. They say to expect to get your results back in 6-8 weeks but mine came in about 3 weeks. Know that you can only test one person per kit. So if I wanted to test both of my parents, I would have to buy 2 more kits at $99 each. So why would I take the test in the first place? Well, they use your autosomal DNA (which you get from both parents) to find out your ethnic breakdown or where in the world your ancestors come from. Pretty cool, right? Before I took the test, I guessed that I would be 72% African with 25% Nigerian and 15% Ivory Coast and 28% European with the bulk of that being British and German. And as you can see below, I was pretty spot on. I am actually 75% African with 27% of that being Nigerian and 16% Ivory Coast along with some other countries. And 21% European with 10% Europe West (which includes Belgium, France and Germany) and 8% British (which includes England, Scotland and Wales). You may notice that there is no Native American DNA, which I did not expect to see anyway. I, unlike some black people, did not believe that I had “Indian in my family” no matter what the family legends suggested. I was most surprised by the Asian and Pacific Islander DNA. I am not sure who in my family tree that would have come from. 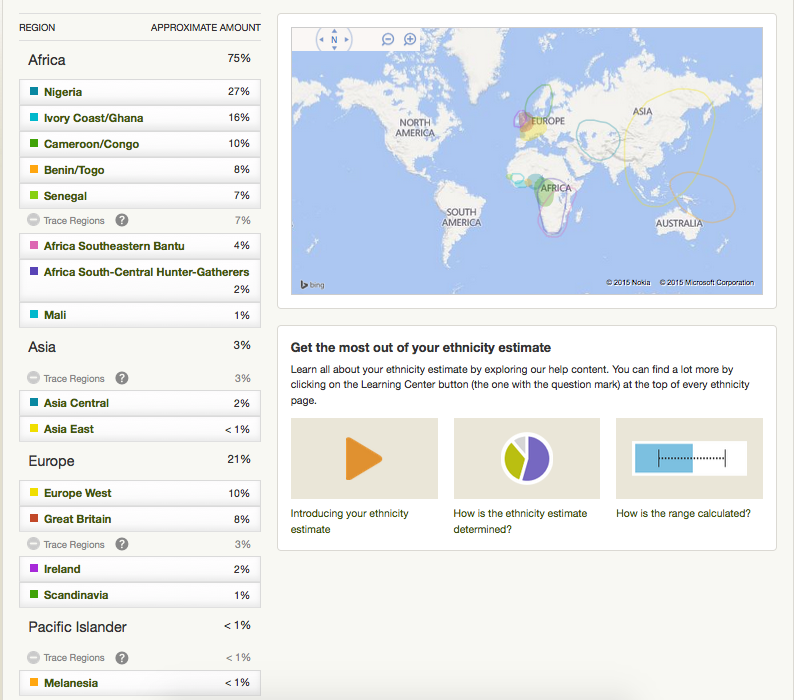 This is really exciting info and I am glad they have this feature, but the main reason I wanted to take the test was because Ancestry also uses the DNA to match it with other people who have taken the test to help you find your distant relatives. I have a couple of mystery fathers 4-5 generations back and I was hoping DNA would connect me to the right people. But this feature is only helpful if you have enough distant relatives on Ancestry that have taken the test and that those relatives have publicly viewable trees. Also, a lot of times either because these cousin’s trees are not complete or just private, it is difficult to even tell who your common ancestor is. AncestryDNA does allow you to search your matches for surnames. So you can search for surnames of people you know you have in your tree with those of your cousin matches. You might not find the same person in both trees but maybe the person in their tree and the person in yours might be distant relatives. But you won’t know until you do more digging. I hope this is helpful for anyone who is doing genealogy research of their own.